TO CELEBRATE FRANCE WITH WORLD PREMIERE BALLETS BY PETER MARTINS AND BENJAMIN MILLEPIEDAND A MAJOR REVIVAL OF GEORGE BALANCHINE’S SYMPHONY IN C.
Collaborators for the Evening Include Composer Nico Muhly and Designers Kate and Laura Mulleavy of Rodarte for the Millepied Premiere. Composer Marc-André Dalbavie and Designer Gilles Mendel for the Martins Premiere And NYCB’s Director of Costumes Marc Happel in Collaboration with Swarovski for New Costume Designs for Balanchine’s Symphony in C.
The One-Time-Only Gala Evening is Sponsored by Christian Dior and Swarovski with Honorary Chairman Natalie Portman and Chairmen Emily & Len Blavatnik, Charlotte Moss & Barry Friedberg and Marie Nugent-Head & James C. Marlas. New York City Ballet announced today that its 2012 Spring Gala on Thursday, May 10 will feature a one-time-only salute to France titled À La Française, and will feature two World Premiere ballets, one by NYCB’s Ballet Master in Chief Peter Martins to a score by the French composer Marc-André Dalbavie; and one by French-born choreographer and former NYCB Principal Dancer Benjamin Millepied to a commissioned score by Nico Muhly. The evening will also include a major revival of George Balanchine’s Symphony in C, which was created for the Paris Opera Ballet in 1947 to a score by the French composer Georges Bizet. Natalie Portman will serve as the Honorary Chairman for the gala evening, with Emily and Len Blavatnik, Charlotte Moss and Barry Friedberg, and Marie-Nugent Head and James C. Marlas as the gala’s Chairmen. The entire evening, which will take place at the David H. Koch Theater at Lincoln Center, is sponsored by Christian Dior and Swarovski. The new work by Benjamin Millepied will be set to a commissioned score by the contemporary classical composer Nico Muhly. A graduate of Columbia University and the Juilliard School of Music, Muhly is currently one of the music world’s most sought-after young composers, and has written numerous orchestral and choral works, as well as scores for dance, opera, and film. His opera Two Boys, a collaboration with playwright Craig Lucas and director Bartlett Sher premiered last year at the English National Opera and is scheduled to makes its Metropolitan Opera debut during the 2013/14 season. Muhly has also collaborated on numerous works outside of the classical-music world, including projects with Björk, Antony and the Johnsons, and the Brooklyn-based indie folk rock band Grizzly Bear. A former dancer with New York City Ballet, Millepied joined NYCB in 1995 and was promoted to Principal Dancer in 2002. Before retiring from dancing with NYCB last year, Millepied danced a wide variety of works in the NYCB repertory and originated roles in ballets by Jerome Robbins, Peter Martins, Alexei Ratmansky, Christopher Wheeldon, and Mauro Bigonzetti, among others. As a choreographer, Millepied has created three previous works for New York City Ballet – Quasi Una Fantasia (2009), Why am I not where you are? (2010), and Plainspoken (2010). This will be the fourth time that Muhly and Millepied have collaborated on a ballet, following previous works for American Ballet Theatre in 2007 (From Here on Out), the Paris Opera Ballet in 2009 (Triade), and the Dutch National Ballet in 2010 (One Thing Leads to Another). Millepied has also created works for numerous other companies around the world including the Metropolitan Opera, the Maryinsky Ballet, Pacific Northwest Ballet, Pennsylvania Ballet and Ballet Genève, as well as for Mikhail Baryshnikov. In 2010 Millepied choreographed and appeared in Darren Aronofsky’s Academy Award-winning feature film Black Swan. The costumes for the new Muhly/Millepied work will be designed by Kate and Laura Mulleavy of Rodarte. Kate and Laura have previously designed and created the ballet costumes for Black Swan, which were sponsored by Swarovski, as well as collaborated with Benjamin Millepied and Nico Muhly on One Thing Leads to Another for the Dutch National Ballet. They are currently collaborating with Frank Gehry on a new production of Don Giovanni for the Los Angeles Philharmonic. Rodarte’s design and costume work has also been featured in solo exhibitions at the Cooper-Hewitt National Design Museum (2010) and the Museum of Contemporary Art, Los Angeles (2011), and the Los Angeles County Museum of Art (2011). Their work is also included in the permanent collections of the Costume Institute of the Metropolitan Museum of Art, the Boston Museum of Fine Art, the Los Angeles County Museum of Art, and the Museum at FIT in New York. Additional performances of the Muhly/Millepied ballet will take place on Saturday, May 12 at 8 p.m.; Tuesday, May 15 at 7:30 p.m.; Wednesday, May 16 at 7:30 p.m.; and Thursday, May 31 at 7:30 p.m. The new work by Martins will be set to the French-born composer Marc-André Dalbavie’s Trio No. 1, for violin, cello, and piano, which was composed in 2008. A graduate of the Paris Conservatory of Music, Dalbavie’s first major piece, Diadèmes, premiered at the Centre Pompidou in Paris in 1986 and has since been performed by orchestras around the world. Now one of the most frequently performed composers of his generation, Dalbavie has received commissions from such prestigious orchestras as the Chicago Symphony, Cleveland Orchestra, Berlin Philharmonic, Philadelphia Orchestra, and the Orchestra de Paris, where he served as composer in residence for four years. The new Martins ballet will mark the first score by Dalbavie to enter the repertory of the New York City Ballet. A long-time champion of contemporary classical music, Martins has previously created ballets to scores by such composers as John Adams, Christopher Rouse, Michael Torke, Charles Wourinen, Wynton Marsalis, and Esa-Pekka Salonen, among many others. Ballet Master in Chief of the New York City Ballet, Martins began his association with the Company in 1967 and during his career as a dancer he originated leading roles in numerous ballets by George Balanchine and Jerome Robbins, and performed a tremendous variety of works before retiring from dancing in 1983. Martins began his career as a choreographer in 1977 with Calcium Light Night, to the music of Charles Ives, and has since created more than 80 ballets for NYCB. Martins is also the Artistic Director and Chairman of the Faculty at the School of American Ballet, the official school of NYCB, and the co-Founder and Artistic Director of the New York Choreographic Institute, an affiliate of NYCB that was created in 2000 to foster new choreography. The costumes for the Dalbavie/Martins work will be created by renowned international designer Gilles Mendel of the fashion house J. Mendel. The Paris-born designer apprenticed under his father Jacques at the eponymous J. Mendel fur salon in Paris, and moved to the United States in the early ‘80s, opening his first J. Mendel boutique at Elizabeth Arden’s Fifth Avenue Salon. He launched a full-scale ready-to-wear collection in 2002, and became known for maintaining the highest level of craftsmanship when manipulating luxury fabrics in unexpected ways. Mendel was inducted into the Council of Fashion Designers of America in 2003 and previously worked with NYCB on the costume designs for Melissa Barak’s Call Me Ben in 2010. Additional performances of the Dalbavie/Martins ballet will take place on Tuesday, May 15 at 7:30 p.m.; Saturday, May 19 at 8 p.m.; and Wednesday, May 23 at 7:30 p.m. The final ballet on the 2012 Spring Gala program will be a major revival of the George Balanchine masterpiece Symphony in C, which NYCB last performed in 2008. Balanchine created the piece in Paris in 1947 to an early, and at the time, mostly unknown score by the French composer Georges Bizet. The four-movement ballet was originally called Le Palais de Cristal when it was first performed by the Paris Opera Ballet. The year after its premiere Balanchine staged the work in New York for Ballet Society, a precursor of New York City Ballet, and renamed the work Symphony in C. The ballet was also included on the program for NYCB’s first performance on October 11, 1948. Now a signature work of the New York City Ballet, Symphony in C returns to the repertory this spring in a major revival with new costumes designed by Marc Happel, NYCB’s Director of Costumes. 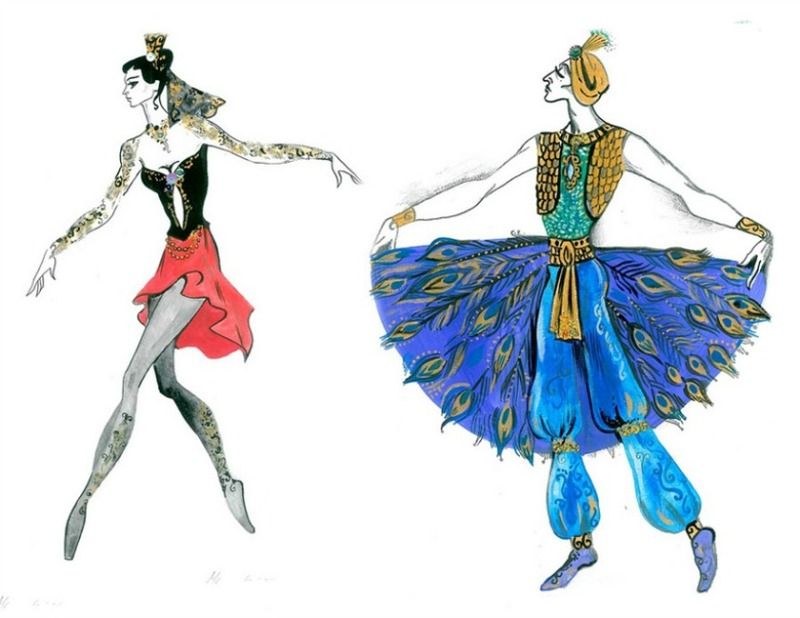 The fully-redesigned costumes will be embellished with SWAROVSKI ELEMENTS, and the production design will also feature all new crystallized tiaras and headpieces created by jewelry designer Robert Sorrel. Former NYCB corps de ballet dancer Jamie Wolf, now a well-known jewelry designer, is creating original earrings, also made with SWAROVSKI ELEMENTS, which will be worn in the production. Wolf will also launch a line of earrings inspired by Symphony in C that will be available for sale with a portion of the proceeds benefiting NYCB. Additional performances of Symphony in C will take place on Friday, May 11 at 8 p.m.; Sunday, May 13 at 3 p.m.; Saturday, May 19 at 8 p.m.; Friday, June 1 at 8 p.m.; and Saturday, June 2 at 2 p.m.
Benefit-priced tickets for the gala evening, which include the performance, a pre-performance reception, and black tie supper ball following the performance, are available through the NYCB Special Events Office at 212-870-5585. Tickets to the performance only start at $29 and are available at the David H. Koch Theater box office, online at www.nycballet.com, or by calling 212-496-0600. New York City Ballet’s 2012 Spring Season will take place from May 1 through June 10 at the David. H. Koch Theater at Lincoln Center. For more information visit www.nycballet.com or call 212-496-0600. Major support for new work at New York City Ballet is provided by contributions from members of the New Combinations Fund and The Fan Fox and Leslie R. Samuels Foundation. Major funding for the 20th Anniversary of the New Combinations Fund is provided by the Rockefeller Brothers Fund. Major support for the À La Française gala program is provided by The Florence Gould Foundation. Peter Martins' new ballet is made possible in part by a generous gift from Maria-Cristina Anzola.